New Flea Signature bass by Fender. 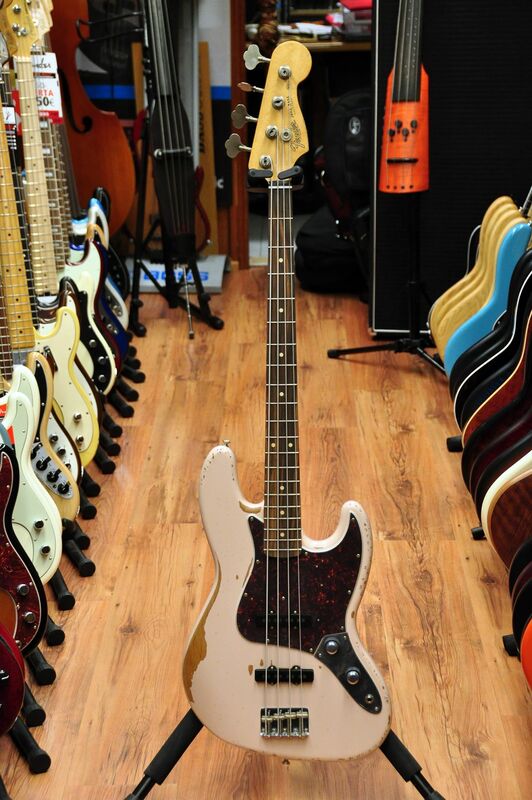 We all relate the great RHCP's bassplayer with a single humbucker bass (Musicman Stingray or Modulus) but the truth is that Flea has used a number of different basses along his lifelong career, including an early 60's Fender Jazz Bass, and that's the bass that has been used as a base model to develop this cool instrument. The most noticeable differences between this model and the rest are the stacked pots with concentric knobs just as they came on an early 60's Jazz Bass. A cool neck plate at the back and Shell Pink finish complete this great looking/great playing bass. If you wanted a Fender Relic instrument, your ony option up until now was a Custom Shop, which was beyond the possibilities of many customers. New new Road Worn series allows you to enjoy the look, feel and sound of reliced instruments without breaking your wallet. These basses have made quite an impact at the last NAMM show in the US. A veritable racecar of a bass, the Jazz Bass was born in the 1960s and became the favorite of players who put as many miles on the instrument as they did on their tour buses. The more it was used (and abused), the more it growled back and became even more comfortable. Fender’s new Road Worn ’60s Jazz Bass guitar delivers that aged look and feel—designed with 1960s specs, including a nitrocellulose-lacquer finish, and built to look, sound and feel like it’s got more than just a few miles on it. Some things just get cooler with age. It’s especially true of electric guitars and basses they develop an unmistakable mojo over time that makes them look cooler and feel even more comfortable than when they were brand new. Fender Road Worn Series guitars and basses come with a head start on history and bring the player the best of both worlds a killer aged design aesthetic that conjures up the ghosts of past music lives, paired perfectly with the modern functionality, playability and high-quality that players know to expect from Fender. The ’60s Jazz Bass features an alder body, maple neck with rosewood fingerboard, vintage-style reverse tuning machines and American Vintage bridge, four-ply brown shell pickguard, and is available in Three-Color Sunburst and Fiesta Red.